: Installation view, 2017, The Old Jail Art Center. Courtesy of the artist. 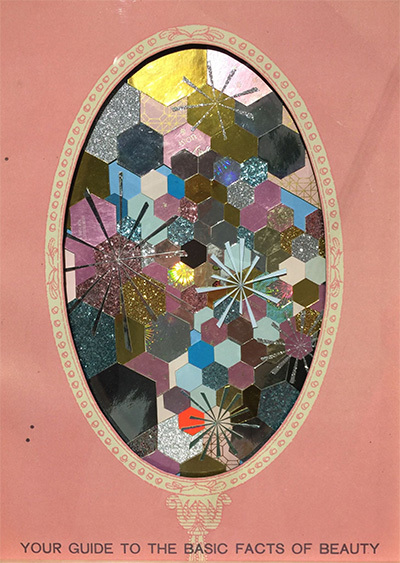 Kelly O’Connor, Dorothy I (The actress best know for her role as Dorothy), 2017, framed diptych, digitally printed image and mixed media collage, 32x4x4 in. © of the artist. Courtesy of David Shelton Gallery. Two hundred miles separate the West Texas towns of Albany and Odessa. Best known for oil derricks and high-school football, Odessa is home to artist Kelly O’Connor’s maternal family and serves as the thematic basis of her work on display at the Old Jail Art Center in Albany, on view through Feb. 3, 2018. 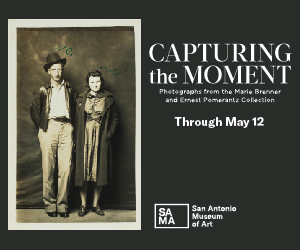 The installation, part of the Center’s Cell Series, explores two places—one imaginary, one real—important to the San Antonio artist, and includes her signature collages, Technicolor wasp nests, and other curiosities. Motifs from The Wizard of Oz have played an integral role in O’Connor’s work since she was an undergraduate studying studio art at the University of Texas at Austin, incorporating the 1939 film’s chimerical landscapes as well as images of its iconic star, Judy Garland. O’Connor’s elaborate collages, which often appropriate images from the 1940s, 50s and 60s, expose mid-century America’s contradictions: the material aspirations and blithe superficiality in popular culture that masked decades riddled with conflict and adversity. O’Connor’s works often focus on the plight of females and the hollow cheerfulness that disguised the depression and oppression that afflicted women of this period. In The Wizard of Oz, Kansan farm girl Dorothy Gale, having been knocked unconscious during a tornado, is transported to the fantasyland of Oz. When she appears before the mighty Wizard of Oz to beseech him to allow her to return home, her dog pulls back the curtain to reveal a bamboozling old man engaged in an artful deception. While nostalgia and childhood memories are often evoked in O’Connor’s creations, this body of work makes more direct personal references. In Portrait of Artist’s Room as a Child (not included in the exhibition), Dorothy Gale’s recurring presence and a cliff-hanging Scarecrow bring to mind the artist’s early connection to The Wizard of Oz. There are elements of frivolity and whimsy in the dreamscape, but the menacing presence of slightly sinister clowns and a lone-wolf silhouette can’t be ignored amid the foreboding undertones, bright colors, and playful images. 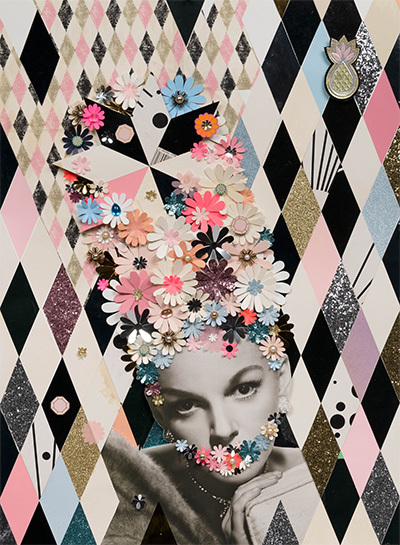 Kelly O’Connor, Mirror mirror, 2017, digitally printed image mounted on board with mixed media collage, 20x16x2 in. © of the Artist. Courtesy of David Shelton Gallery. O’Connor grew up not knowing much about her reclusive and aptly named grandmother, Dorothy. In her diptych Dorothy I and Dorothy II, O’Connor compares the two Dorothys, both 19 when photographed. Their glamorous visages, surrounded by colorful patterns and embellished with hand-cut flowers, are false fronts for lives filled with adversity. She explains: “Judy Garland is a fascinating contradiction; she represents the conflict of American idealism with her shiny facade and psychologically troubled history. While Judy and my grandmother had disparate financial situations and opportunities, both were tormented by omnipresent forces of abuse, depression, addiction, and psychosis.” For O’Connor, the town of Odessa carries similar contradictions in its juxtaposition of oil-boom lavishness and small-town destitution and the chasm between wealthy and poor residents. At the Old Jail Art Center, she found unlikely inspiration in the inmate cells that have been converted to galleries. She evokes their original purpose through the addition of some furnishings: “The cell acts as a metaphor for confinement and informs the work I have created in many ways. Included in the installation are several environmental elements to reinforce the idea of a domestic space: a toilet, sink, and cot. Each of these archetypal objects is unified by the color green, a color iconic of Oz.” Further emphasizing the domesticity of the space is her HEROINE sculpture comprised of collected glass bottles painted in her oft-used palette of bubble-gum pink, chartreuse and turquoise and arranged on green pedestals. 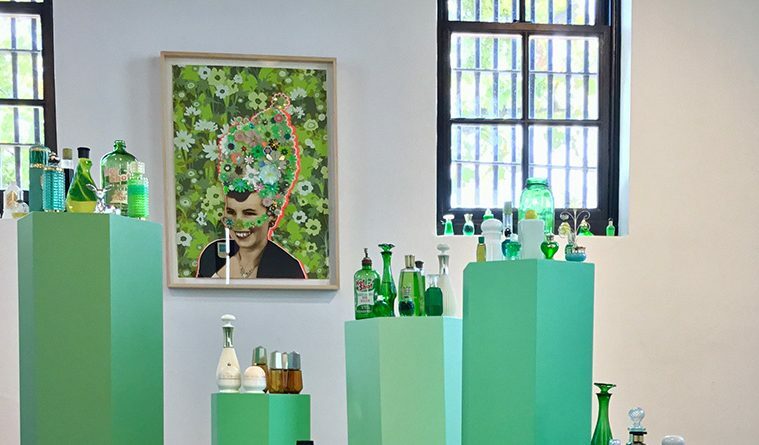 Beyond the sculpture’s nod to the Emerald City’s silhouette and hue, it creates an interesting tension between the fragile impracticality of the bottle collection and the harsh functionality of the prison cell. The cell, from O’Connor’s feminist perspective, represents the limitations that society has historically imposed on women. Among the assortment of bottles are Avon perfume and Pond’s cold cream, Aunt Jemima syrup, and Hot Shot bug killer. These vintage products hark back to an era of feminine restraint and stereotypes, and also touch on the hoarding that the artist cites as a symptom of her grandmother’s depression. O’Connor’s melding of glamour and affliction carries through in the real wasp nests that she has hung from the ceiling of the gallery. Texans can relate to the anxiety that comes with spotting paper wasp nests under eaves, but O’Connor’s vespine nests are painted luminescent gold and contain vividly colored and glittered eggs. In her older works, such as Young and Insane, BADLAND, and Old Faithful, O’Connor reinforces the continuity of her layered message emphasizing the dark side of the American dream. While her artwork usually appropriates popular images from mid-20th century, her artistry also encompasses contemporary culture through the similar afflictions of superficiality, vacant idealism and celebrity worship. Dorothy Gale was awestruck by the alluring and glittering image of Oz and all its promise when in reality it was an empty fantasy. This duality is at the core of O’Connor’s work. She presents just enough ambiguity to allow viewers the freedom to decipher the pieces through their own experiential lenses. She cleverly employs nostalgia and pop culture to propel them on their adventures into interpretation. 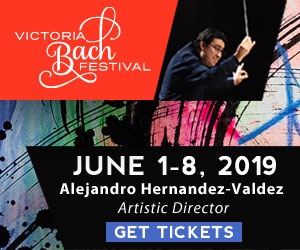 Attendees will be delighted and at the same time disquieted. Illa Gaunt received her M.A. in Art History from the University of Houston. She is an art consultant based in Houston.